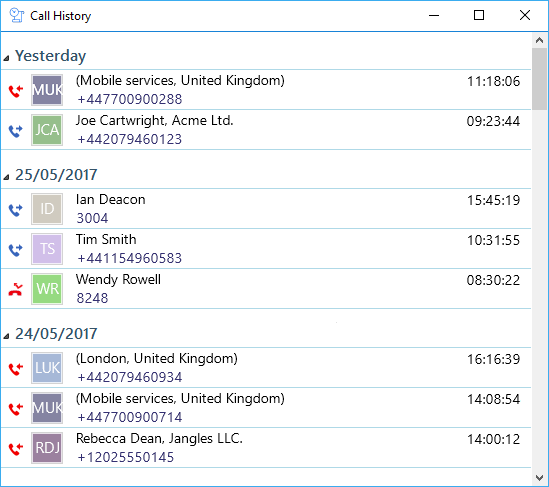 The Call History window is accessed from the Call History item on the main menu or from the tray icon menu. As well as reviewing recent activity, you can dial someone from here by clicking on their telephone number. By default, the Call History screen returns the fifty most recent calls. You can add a new contact record to the Personal Phone List from your Call History by clicking on where the name would appear (it will be a location name in brackets instead). When you do this, the Create contact window will appear. You should also see the Show Contact item for known contacts or the Add Contact item for unknown numbers. Clicking either will open the Contact Record window.